The SDC-MSD10G provides all key Summit brand hardware and software in a Secure Digital Input/Output (SDIO) module, The SDC-MSD10G is ideal for integration in application specific devices like portable data terminals, portable printers and medical devices. 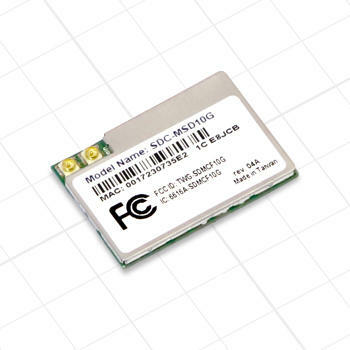 Hardware innovations enable the SDC-MSD10G module to provide far greater performance and range than WLAN radio modules designed for office and consumer applications while minimizing power consumption and allowing for operation in challenging environments. Wi-Fi Alliance:802.11a, 802.11b, 802.11g. WPA Enterprise WPA2 Enterprise. Cisco Compatible Extensions (Version 4). ETSI, FCC, IC, MIC. RoHS compliant. ETSI: 13 (3 non-overlapping). FCC: 11 (3 non-overlapping). MIC: 14 (4 non-overlapping). KC: 13 (3 non-overlapping).